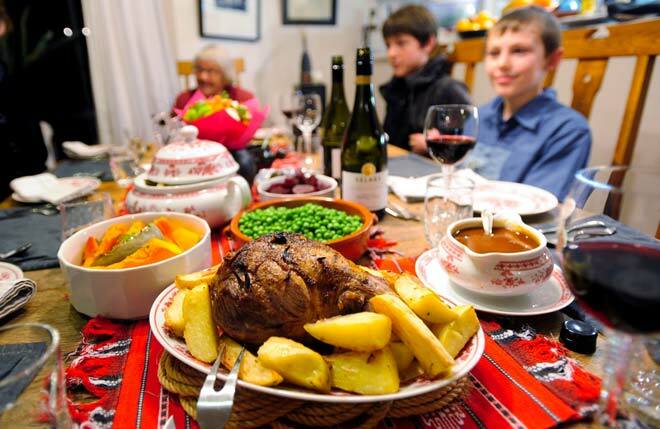 The family roast dinner on Sundays – typically eaten in the middle of the day – was very common in New Zealand until the last quarter of the 20th century. Roast lamb or beef topped with gravy was accompanied by roast vegetables such as potatoes and pumpkin, along with boiled peas and carrots and sometimes a baked Yorkshire pudding. In 2010 wine producer Selaks first sponsored an annual New Zealand Roast Day in an attempt to revive the tradition. One difference from the Sunday roasts of old was the presence of wine on the table, as in this meal in 2011. Mid-20th-century New Zealanders would have been more likely to drink water or beer, and in some cases sherry, with their roasts.